In the 2006–07 season, Bosh led the Raptors to their first playoff appearance in five years, and their first ever division title. He left Toronto for the Heat in 2010 as its all-time leader in points, rebounds, blocks, double doubles, free throws made and attempted and minutes played. Bosh won his first NBA title after Miami defeated the Oklahoma City Thunder 4–1 in the 2012 NBA Finals. He won his second title in 2013 as the Heat defeated the San Antonio Spurs in the 2013 NBA Finals. 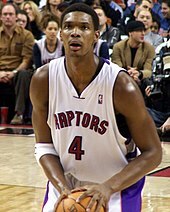 Bosh was nicknamed "CB4" by then-Toronto Raptors play-by-play commentator Chuck Swirsky, a combination of Bosh's initials and then jersey number. Seeking to promote sports and education amongst youths in Dallas and Toronto, Bosh set up the Chris Bosh Foundation and regularly speaks to youths about the benefits of reading. Born in Dallas, Texas, to Noel and Freida Bosh, Chris Bosh grew up in Hutchins, Texas. A family-oriented person, Bosh often played basketball in the house with his younger brother, Joel. By four years of age, he began learning how to dribble a basketball in the gym, where his dad played pick-up games. Although Bosh was always tall since youth and this allowed him to out-rebound others in basketball games, he only started learning the game around fourth grade at a playground near his grandmother's house. Apart from basketball, Bosh also played baseball up until high school, preferring to play as a first baseman. Growing up, Bosh names his parents as the biggest influences on his personality and considered NBA superstar Kevin Garnett as his favorite athlete, modeling his play after him. Academically, Bosh always did well in school, but he began to garner significant attention from college recruiters when he led Lincoln High School in Dallas to the number one ranking in the country and the USA Today National Championship with a perfect 40–0 season. The teenager went on to lead Lincoln High to win the Class 4A state title as he racked up 23 points, 17 rebounds and nine blocks. Bosh was subsequently named High School Player of the Year by Basketball America; Powerade Player of the Year in Texas; a first-team All-American by Parade, McDonald's and EA Sports; a second-team all-American by USA Today and SLAM Magazine; a first-team all-state player; and "Mr. Basketball" in Texas by the Texas Association of Basketball Coaches. With his combination of grades and basketball skills, Bosh was on a number of college recruiting lists. The University of Florida and the University of Memphis made serious attempts, but it was Paul Hewitt, coach of Georgia Tech, who made the best impression. Bosh felt Hewitt would look out for his best interests and respect his aspirations to play professional basketball; moreover, Georgia Tech's transition offense impressed the teenager. Bosh eventually chose to follow the footsteps of his cousin and aunt and attended Georgia Tech to study graphic design and computer imaging, and subsequently, management. There, he led the Yellow Jackets in averaging 15.6 points, 9.0 rebounds and 2.2 blocks in 31 games, and led the Atlantic Coast Conference in field goal percentage (.560), joining Antawn Jamison as the only freshmen ever to do so. Bosh originally intended to complete his degree, but by the end of the 2002–03 season, his strong performances convinced him that he was ready for the NBA. He left Georgia Tech after his freshman season and entered the 2003 NBA draft. Bosh said in future interviews that although he misses his college days, he believes he made the right decision to pursue a professional career. He said he intends to obtain a college degree in the future, to fulfill a promise made to his mother. In a strong draft class including future All-Stars LeBron James, Carmelo Anthony, and Dwyane Wade, Bosh was selected fourth overall by the Toronto Raptors in the 2003 NBA draft and was signed on July 8, 2003. Prior to his signing, however, other NBA teams made offers for Bosh as they knew Toronto needed a veteran scorer, and Raptors star Vince Carter himself pressed for a trade. General Manager Glen Grunwald turned everyone down. In his rookie season, Bosh was forced to play out of position as the Raptors' starting center after Antonio Davis was traded to the Chicago Bulls. Night after night, the teenager with the "slim frame" battled against opponents who had a significant size and strength advantage over him. Bosh—who cited teammate Michael Curry as his mentor—was often praised by his coaches for his heart, and willingness to play through pain and injuries resulting from his lack of body strength compared to some of the league's strong forwards and centers. Bosh's contributions were not unnoticed by teammates either, as he averaged 11.5 points, 7.4 rebounds, 1.4 blocks, and 33.5 minutes in 75 games, leading all rookies in rebounding and blocks, and setting a franchise record for most rebounds in a rookie season with 557. Bosh was rewarded by being selected to the NBA All-Rookie First Team for the 2003–04 season. Bosh and his teammates in a 2005–06 game against the Milwaukee Bucks. From left: Pape Sow, Bosh, Mike James and Morris Peterson. With the departure of the disenchanted franchise face of the team, Vince Carter, in December 2004, Bosh was simultaneously anointed as the new leader around whom Toronto would build. In the remaining games following Carter's departure, the power forward averaged 18.4 points, 9.5 rebounds, 1.6 blocks, and 38.1 minutes per game, improving in every major statistical category. He was awarded his first ever NBA Eastern Conference Player of the Week for games played between 3 and 9 January 2005. As the season drew to a close, analysts predicted that Bosh would become an All-Star one day. Bosh ended the 2004–05 season as the leading scorer and leading rebounder for the team on 21 and 46 occasions respectively. Prior to the 2005–06 season, Bosh was named as one of Toronto's team captains. Bosh continued to work on his game as he consistently chalked up double doubles, leading the team in scoring, rebounding, and field goal percentage for the first half of the season. On February 9, 2006, for the first time in his career, Bosh was selected to play in the 2006 NBA All-Star Game in Houston, Texas as a reserve forward for the Eastern Conference. He was only the third Raptor to make an All-Star game, after Carter and Antonio Davis. Bosh's selection was just three days after he was named NBA Eastern Conference Player of the Week for the second time in his career. In March 2006, following a season-ending injury to Bosh, the Raptors hit a 1–10 skid. This highlighted Bosh's importance as the centerpiece of the offense, as well as the leader of the team. The Raptors finished the season 27–55 and Bosh averaged 22.5 points, 9.2 rebounds, and 2.6 assists per game. Despite a major off-season revamp of the Raptors roster—including the departure of good friends Mike James and Charlie Villanueva—Bosh officially signed a three-year contract extension with a player option for a fourth year on July 14, 2006. The deal was reportedly worth US$65 million over four years. Upon signing the contract, Bosh said "I think the future is very positive for the franchise... change was needed... we have a lot of guys who just want to win and are willing to work hard." During the same press conference, Bosh also announced a donation of $1,000,000 to a Toronto charity, known as Community Legacy Programs. After a shaky start to the Raptors' 2006–07 campaign, the Raptors managed to surpass the .500 mark as the All-Star break approached. Bosh's play and leadership were pivotal to this run and as an increasing recognition of his abilities, on January 25, 2007, he was named an All-Star starter for the East in the 2007 NBA All-Star Game. Bosh received the second highest number of votes among all Eastern Conference forwards. This was his first All-Star start and second overall All-Star appearance, having averaged over 22 points and 11 rebounds in the first half of the season. On January 31, 2007, in a game against the Washington Wizards, Bosh scored a 65-foot (20 m) buzzer-beating shot to end the third quarter of the game. He shot 15-of-15 after missing his first four shots. Bosh's in-form streak enabled him to be selected Eastern Conference Player of the Month for January 2007. He had averaged 25.4 points and 9.1 rebounds while leading the Raptors to a 10–5 record in that month. On February 7, 2007, Bosh's career-high 41 points prompted the home fans to chant "MVP"—an unprecedented event in the Air Canada Centre. Two days later, Bosh collected 29 points and 11 rebounds against the Los Angeles Lakers, shooting 10-of-10 in the second half. On March 28, 2007, Bosh became the new franchise record holder for double doubles in a home win against the Miami Heat. He was named Eastern Conference Player of the Week for the third time in his career shortly after, having led Toronto to clinch a playoff berth for the first time in five years. Toronto went on to win its first ever division title, and concluded the regular season with a 47–35 record, including a 30–11 home record, both franchise records. 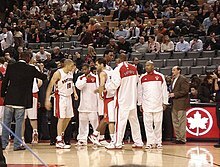 As third seed, the Raptors played sixth seed New Jersey Nets in the first round of the 2007 NBA Playoffs. The series drew much media attention as Carter, who left had Toronto under acrimonious circumstances, was back at the ACC as a Net. Toronto's inexperience was evident as they struggled offensively throughout the game, to eventually lose 96–91. The Raptors won Game 2 at the ACC to tie the series 1–1, as Bosh recorded 25 points and a game-high 13 rebounds. The Nets won Games 3 and 4 to lead 3–1, but Toronto forced Game 6 when they narrowly won 98–96 in Game 5. The Nets went on to clinch the series with a win in Game 6. Bosh averaged a double-double with 22.6 ppg and 10.7 rpg for the regular season, both career-highs, and posted 17.5 ppg and 9.0 rpg for the playoffs. He was named to the All-NBA Second Team at the end of the 2006–07 campaign. Before the 2007–08 season began, Andrea Bargnani, the number one pick in the 2006 NBA draft, was slated to start at center and Bosh at power forward to form a strong Toronto frontcourt and Jason Kapono, a three-point specialist, was acquired via free agency from the Miami Heat to add offensive firepower; however, as the season unfolded, neither plans materialized as hoped. Bosh himself had a slow start to the season, but as mid-season approached, his form picked up and he was named Player of the Week for the second week of January. On January 31, 2008, he was selected to be on the Eastern Conference team for the 2008 NBA All-Star Game. Bosh missed 15 games throughout the season, but the Raptors still managed to conclude the regular season with a 41–41 record, thus clinching the sixth seed in the Eastern Conference for the 2008 NBA Playoffs. However, they were defeated by the Orlando Magic in the first round, losing 4–1. The first-round series against the Magic was touted as the matchup between two of the league's best young big men in Bosh and Dwight Howard. Howard dominated throughout the series, while Bosh had a serires-best effort in Game 4 with 39 points and 15 rebounds. General Manager Bryan Colangelo said at a press conference after the series, "Whether it's protecting [Bosh] inside the paint, getting a little bit more of a presence in there, to just getting him another scorer that's going to shoulder some of that burden, it's something that's clear we have to get better", hinting that the roster was in need of an overhaul. Bosh said after the loss, "They played a great series, they executed on offence and defense better than we did and when it came to the small things, they did a better job... I can't sit here and bark in protest that the better team didn't win. That's pretty obvious. They beat us pretty good." Unlike the previous campaign, Bosh was not named to any of the All-NBA teams. To provide Bosh with an experienced frontcourt partner, the Raptors pulled a blockbuster trade prior to the 2008–09 campaign: six-time All-Star Jermaine O'Neal was acquired from the Indiana Pacers. Bosh—who had won an Olympic gold medal with the national team at Beijing 2008—started the season strong. He averaged 26 points, 10 rebounds and 3.7 assists in his first three games and was named Eastern Conference Player of the Week for the fifth time in his career. A week later, he became Toronto's all-time leader in offensive rebounds, surpassing Antonio Davis's record. While Bosh and O'Neal formed a formidable partnership in the frontcourt, the Raptors struggled to surpass the .500 mark. The principal deficiency of previous campaigns—wing players—continued to upend Toronto's progress. With the Raptors at 8–9, head coach Sam Mitchell was sacked and replaced by Jay Triano. Despite the move, injuries and weaknesses in the roster meant that the Raptors entered the All-Star break 13 games under .500. On January 29, 2009, Bosh was named an All-Star reserve, but an injury ruled him out of the game. Two weeks later, in a bid to bring in a wing player and create greater salary flexibility, O'Neal and Jamario Moon were traded to Miami for Shawn Marion and Marcus Banks. The trade did not improve the team's win–loss record, however, and the Raptors were eliminated from contention with seven games of the regular season remaining. The bright spark in Bosh's campaign was his career-high 22.7 points per game, as well as his being one of two players in the league that season (the other being Dwight Howard) to average a 20/10 in points and rebounds. On April 20, 2009, Colangelo announced that he would offer Bosh a contract extension during the summer, which Bosh later refused to sign. 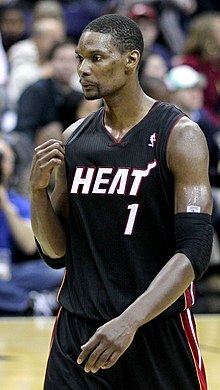 To prepare for the 2009–10 season, Bosh worked out under Ken Roberson, looking to add 20 pounds and bring his weight up to 250. Following the failure of the 2008–09 campaign, Colangelo knew that he had to shake up the roster to persuade Bosh to stay, and the Raptors were one of the busiest teams in the pre-season market. They opened their season with a win against the heavily favored Cleveland Cavaliers, in which Bosh scored 21 points and pulled down 16 rebounds. Bosh went on a tear, averaging 25.4 points and 11.9 rebounds in the first 16 games, but the Raptors were only able to win seven of those games. The Raptors crossed into 2010 with a 16–17 record, and on January 3, 2010, Bosh overtook Vince Carter as Toronto's all-time leader in total points scored. After pulling together a string of wins, Toronto were .500 after 40 games. Bosh was the league leader in double doubles at the time, being only one of two players in the league who averaged at least 20 points and 10 rebounds a game. On January 20, 2010, he scored a career-high 44 points in a loss against the Milwaukee Bucks, while collecting his 220th career double double. That same month, Bosh was named a reserve for the Eastern Conference All-Star team, and was Eastern Conference Player of the Week. After the All-Star break, the Raptors went on several losing streaks and an injury to Bosh exacerbated the situation. As the regular season came to a close, the Raptors went from being the fifth seed before the All-Star break to fighting for the eighth and final playoff spot with the Chicago Bulls. After recording his 44th double double on March 22, 2010, Bosh became the Raptors' all-time leader in number of double doubles in a season. On April 5, 2010, he was named the Eastern Conference Player of the Week, winning the honor for the seventh time in his career (tying Carter for the most in franchise history). However, Bosh was unable to play in a pivotal match against the Bulls on April 11, 2010. The blowout loss cost Toronto their tie-breaker and ultimately the eighth seed, as the Bulls finished with 41 wins to Toronto's 40. After the 2009–10 season was over, there was much speculation over whether coveted free agents such as LeBron James, Dwyane Wade, and Bosh would sign with new teams for the 2010–11 season. Bosh was active on the social media front, posting his thoughts on Twitter and having a documentary crew record his meetings with the teams interested in signing him. On July 10, 2010, Bosh officially completed a sign-and-trade deal with the Miami Heat, teaming up with Wade and James. Bosh's parting message to the Raptors on his website said, "[K]now that this was my toughest decision, mostly because Toronto has been so great to me. I've loved every minute here and I just wanted to thank you from the bottom of my heart..." Not only did Bosh leave Toronto as its all-time leader in virtually all major statistical categories, he was one of only three players in the league who accrued 10,000 points, 4,500 rebounds, and 600 blocks in his seven seasons with the Raptors. Despite being widely tipped as contenders, the Heat got off to a tentative 9–8 start. The Heat managed to go on to compile a 21–1 record, however, and were jostling with the Boston Celtics and Chicago Bulls for pole position in the Eastern Conference as mid-season approached. Miami finished the regular season with 58 wins and faced Philadelphia in the first round of the playoffs. Miami won the series in five games, and also prevailed in five games in the semi-finals against Boston. In the Conference Finals against Chicago, Bosh was particularly instrumental, averaging 23.2 points in the 4–1 series win. He was slow off the blocks in the Finals against Dallas, shooting below .300 in the first two games, but scored the winning shot in Game 3 to give Miami a 2–1 lead. That was the last game Miami won, as Dallas won the next three to win its first ever championship. Bosh was seen sobbing as he walked to the locker room following the loss. 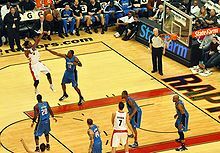 On January 5, 2012, Bosh led the Heat to a 116–109 triple overtime win against the Atlanta Hawks, highlighted by a three-point shot he made to force the game into overtime with 0.06 seconds left to play in the fourth quarter. Bosh finished the game with 33 points, 14 rebounds, 5 assists, 2 steals, and 2 blocked shots. By season's end, the Heat had embraced a small ball strategy that featured Bosh at the center position. In the playoffs, Bosh started at center and averaged 14.0 points and 7.8 rebounds a game. In Game 1 of the Conference Semifinals against the Indiana Pacers, he suffered a lower abdominal strain that forced him to miss the rest of the series and the first four games of the Eastern Conference Finals against Boston. Boston pushed Miami to seven games, and in the final game, Bosh scored 19 points, including 3 of 4 shooting from three point range, to help the Heat advance to their second straight NBA Finals, this time against the Oklahoma City Thunder. The Thunder won the first game of the series before Miami rolled to a 4-1 victory, giving Bosh his first NBA Championship. Bosh scored 24 points in the deciding Game 5 and averaged 14.6 points and 9.4 rebounds in the Finals. Bosh remained the Heat's starting center during the 2012–13 season. On February 15, 2013, Bosh was picked as an All-Star starter over the injured Rajon Rondo by coach Erik Spoelstra. The Heat achieved the league's best record and swept through the first round of the playoffs against the Milwaukee Bucks before defeating the Chicago Bulls in five games, with Bosh scoring 20 points to go with 19 rebounds in a crucial Game 3 win in Chicago. Bosh averaged 12.1 points per game throughout the playoffs, as the Heat advanced to the NBA Finals to face the San Antonio Spurs following a grueling seven-game series against Indiana. The Heat and Spurs split the first two games before the Spurs blew out Miami in Game 3 to take a 2–1 series lead. In Game 4, Bosh scored 20 points and grabbed 13 rebounds to complement Wade's 32 points and James' 33 points to bolster the Heat's win, tying the series. San Antonio would bounce back in Game 5 to force the Heat to win the final two games at home. In the final seconds of Game 6, James missed a three-pointer, and Bosh grabbed the offensive rebound and found a wide open Ray Allen in the corner. Allen hit the shot to tie the game, and in overtime the Heat had a three-point lead with seconds left. San Antonio inbounded the ball to Danny Green, who attempted a corner three, but Green's shot was blocked by Bosh to secure the Heat's victory. Bosh was held scoreless in Game 7 by Tim Duncan, but the Heat still won the game and the series to claim their second consecutive NBA Championship. In the 2013–14 season, Bosh played and started in 79 games, averaging 16.2 points and 6.6 rebounds per game. He also hit a career-high 74 three point shots on 33 percent shooting from beyond the arc. In the playoffs, Bosh helped the Heat return to the NBA Finals, where they faced the San Antonio Spurs once again. This time, however, the Heat were outclassed by the Spurs, as they lost the series in five games. On July 30, 2014, Bosh re-signed with the Heat after LeBron James announced he was leaving Miami to return to the Cleveland Cavaliers. After averaging 21.6 points, 8.2 rebounds, 2.1 assists and 1.1 steals over the first 23 games of the 2014–15 season, Bosh was ruled out indefinitely on December 15 with a strained calf. He went on to miss eight games before returning on December 29 against the Orlando Magic. After playing in the 2015 All-Star Game, Bosh was admitted to a Miami hospital for lung tests during the All-Star break. On February 21, 2015, he was ruled out for the remainder of the season due to a blood clot in one of his lungs. On October 28, 2015, Bosh made his return to the court in the Heat's season opener against the Charlotte Hornets, recording 21 points and 10 rebounds in a 104–94 win. On November 10, 2015, he scored a then season-high 30 points in a 101–88 win over the Los Angeles Lakers. On December 28, 2015, he recorded 24 points and 12 rebounds against the Brooklyn Nets, and hit a career-best 5-of-5 from three-point range. On January 4, 2016, he recorded a season-high 31 points and 11 rebounds in a 103–100 overtime win over the Indiana Pacers. Though he was voted to play in the 2016 NBA All-Star Game, and selected to compete in the Three-Point Contest, due to a calf injury, Bosh was forced to withdraw from both. A blood clot in his leg again forced Bosh to miss time following the All-Star break. He faced increasing pressure from physicians and the Heat organization to sit out the rest of the season because of the potential dangers of the recurring medical condition. In September 2016, Bosh failed his physical exam with the Heat and was not cleared by the team to participate in training camp. Bosh was initially optimistic in a return to the Heat for the 2016–17 season, and the organization had become increasingly hopeful that he would be cleared for camp. That quickly changed, however, due to numerous setbacks accredited to continued blood clotting. On September 26, 2016, Heat president Pat Riley said that the team viewed Bosh's career with the team as over, and noted that the team was no longer working toward his return. On May 24, 2017, Bosh and the Heat reportedly reached a unique parting agreement in which he would leave the Heat without taking up their salary cap for the 2017–18 season. On June 2, 2017, the NBA ruled that Bosh's blood clotting issues were a career-ending illness, meaning the Miami Heat were able to remove his contract from their salary cap once they officially release him. On July 4, 2017, the Heat announced that they had waived Bosh, ending a seven-year stint with the organization. Out of respect, Heat president Pat Riley said following Bosh's release, "The number '1' will never be worn by another player and we can't wait to someday hang his jersey in the rafters". Bosh's national team career began in 2002 when he was selected as a member of the 2002 USA Basketball Junior World Championship Qualifying Team that finished with a 4–1 record and the bronze medal. After his NBA career began, Bosh was named in March 2006 to the 2006–2008 United States men's national basketball team program, and helped lead the team to a 5–0 record during its pre-World Championship tour. In August 2006, Bosh was named as a member of the 2006 USA World Championship Team. Together with fellow 2003 draftees Dwyane Wade, LeBron James, Carmelo Anthony, and Kirk Hinrich, this team competed in the 2006 FIBA World Championship. The team won the bronze medal, defeating former 2004 Olympic champion Argentina. Bosh was ranked sixth in field goal percentage. Following the 2006–07 season, Bosh was named to the team that would compete in the 2007 FIBA Americas Championship. However, he sustained a foot injury and withdrew from the squad. On June 23, 2008, he was named to the team that would compete in the 2008 Olympic Games in Beijing. During the tournament itself, Bosh operated as the main backup to center Dwight Howard as Team USA went unbeaten in all eight games en route to the gold medal, defeating Spain in the final. He averaged 9.1 points per game, and led the team in rebounds with 6.1 a game. In June 2012, Bosh withdrew his name from consideration for the 2012 Olympics in London to recover from a lower abdominal strain that kept him out of some playoff games. You are not going to see a whole lot of screaming and hollering at guys... He is a guy that is going to pull somebody aside and say it in a positive way, and I think it goes a lot farther that way. The mid-range jump shot is one of Bosh's trademark moves. Bosh has traditionally played the power forward position, including during his first season with the Miami Heat. However, starting in the 2011–12 season, he began to start at center and played the position during the team's consecutive championships. Listed at 6 ft 11 in (2.11 m) and 235 pounds (107 kg), Bosh possesses excellent speed, athleticism, and ball handling for a player of his size. He is particularly noted for his ability to drive to the basket and finish strong or get to the free throw line—where he is also proficient—but he is also known for his well-developed jump shot. Indiana Pacers coach Jim O'Brien once commented on the match-up problems Bosh posed for opposing defenders: "We've tried over the years to put big guys on him. It doesn't work. We've tried to put small guys on him. It doesn't seem to work either. I don't know if we have somebody to play Bosh, to tell you the truth." When he was the centerpiece of the Raptors' offense, Bosh was often double teamed, and he was noted to unselfishly pass the ball to teammates who were in better shooting positions. He improved his shooting range when he worked on his three-point shooting during the summer of 2006 and showed improvement in the 2006–07 season. On November 8, 2006, against the Philadelphia 76ers, he hit a game-winning three-point shot with 6.1 seconds left. It was reminiscent of the shot that marked his "arrival" to the NBA in his first season, when he hit a game-tying three-pointer against Houston to send the game to overtime. When the 2006–07 season concluded, Bosh had shot .343 from the three point arc for the season; he improved to .400 the following season. Despite his ability to hit three-pointers, it was during his tenure with the Miami Heat that he began to be relied upon as one of the team's outside shooters, taking multiple three-pointers throughout the 2012 and 2013 championship runs. During the 2013–14 season, Bosh shot and made more three-pointers than at any point during his career, and continued to make crucial shots during the playoffs. Bosh is noted for his leadership. When he was the leader of the Raptors, he was not known for being vocal on the court, preferring to maintain his quiet and humble demeanor but expecting his teammates to match his work ethic. However, Bosh was also known to deliver stern rebukes to teammates who make bad calls on the court. Throughout his career, comparisons have been made between him and Kevin Garnett due to their similar style of play and physique. Besides his on-the-court exploits, Bosh was a National Honor Society member and graduated with honors from Lincoln. He is also a member of the National Society of Black Engineers and the Dallas Association of Minority Engineers. Following his success in the NBA, Bosh soon had his own YouTube channel, and has since made various TV appearances. In December 2009, First Ink, a DVD featuring comedic digital shorts and a documentary about Bosh, was released. The DVD was filmed during the summer of 2009. A fan of the X-Men cartoon as a child, Bosh voiced the Marvel character Heimdall in an episode of Hulk and the Agents of S.M.A.S.H. in 2014. He has also made appearances of episodes of Entourage and Parks and Recreation. In the field of philanthropy, Bosh established the Chris Bosh Foundation in 2004. Remembering the challenges he faced as a youth, Bosh founded the organization to help younger people in academics and athletics. The Foundation, with programs in Toronto and Dallas, has worked closely with organizations such as the Toronto Special Olympics to raise important funding for community projects. Bosh's mother, Freida, has served as CEO of the Foundation. As an avid reader, Bosh also regularly speaks to groups of children about the benefits of reading, and has received the NBA Community Assist Award for his active contributions for the Raptors community development program in Toronto and Dallas during the course of the NBA campaign. In November 2008, Bosh pledged to donate $75,000 to the Boys and Girls Clubs of Canada. He is also an advocate for increased computer literacy in schools, supporting the non-profit code.org. In July 2011, Bosh married Adrienne Williams. The couple have four children, three sons and one daughter. Bosh has dabbled in hip-hop production. In 2017, alongside record producer, songwriter, and singer Rico Love, Bosh co-produced a song titled "Miss My Woe" by Gucci Mane. The song is featured on Gucci's eleventh studio album titled, Mr. Davis. On March 24, 2009, it was reported that Bosh's former girlfriend, Allison Mathis, was seeking child support and sole custody of their daughter, Trinity (born November 2, 2008). Mathis alleged that when she was seven months pregnant, Bosh stopped supporting her financially and tried to remove her from their home. Three days later, it was reported that the dispute was only over the amount Bosh paid. Mathis' lawyer also told the press, "My client very much wanted this dispute to remain private. Certainly this thing did not get started by anything on our side... She is very distressed that somehow this thing got into the newspapers. She wants Trinity to have a good relationship with her dad, Chris Bosh, and adverse publicity makes that more difficult." Jump up ^ Gallay, Mike, "The Birthday Bosh", nba.com/raptors, March 24, 2004, accessed April 30, 2008. ^ Jump up to: a b c d e f g h i j k l Chris Bosh Info Page – Bio Archived 2007-02-19 at the Wayback Machine., nba.com, accessed August 3, 2007. ^ Jump up to: a b Mawhinney, Janice, "Playing by the book; Raptors star uses money and charisma to make sure literacy is a winner with Toronto schoolkids", Toronto Star, November 26, 2005. ^ Jump up to: a b c d e Colbourn, Glenn, "A new Bosh in Raps' town", Toronto Star, January 13, 2004. ^ Jump up to: a b c d e f "About". Official Website of Chris Bosh. Archived from the original on April 15, 2007. Retrieved February 9, 2016. ^ Jump up to: a b c d Aldridge, Andre, "CHATTING WITH CB4", nba.com, January 2, 2007, accessed August 3, 2007. ^ Jump up to: a b c d e Chris Bosh Biography, jockbio.com, accessed August 25, 2007. ^ Jump up to: a b Player Bio: Chris Bosh, ramblinwreck.com, accessed April 29, 2007. Jump up ^ "Raptors Sign Chris Bosh", nba.com/raptors, July 8, 2003, accessed March 20, 2007. ^ Jump up to: a b Feschuk, Dave, "Vegas trip leaves Bosh bushed", thestar.com, February 18, 2007, accessed March 20, 2007. Jump up ^ "Chris Bosh's evolution into an NBA star", ctv.ca, February 18, 2007, accessed March 20, 2007. Jump up ^ Kahn, Mike, "The sky, Bosh? Raptors rookie just getting started" Archived 2004-02-03 at the Wayback Machine., cbs.sportsline.com, January 26, 2004, accessed March 20, 2007. Jump up ^ 2004–05: End Of The Carter Era, nba.com/raptors, accessed April 27, 2007. Jump up ^ Wick, Norma, "All Flights Cancelled, nba.com/raptors, January 10, 2005, accessed April 27, 2007. Jump up ^ Ball, Mike, "Still An All-Star In This Town", nba.com/raptors, January 17, 2005, accessed April 27, 2007. ^ Jump up to: a b "Bosh Named NBA's Eastern Conference Player of the Week", nba.com/raptors, February 6, 2006, accessed April 27, 2007. Jump up ^ "Charlie Villanueva Nets 48 in OT Loss in Milwaukee", nba.com/raptors, March 26, 2006, accessed August 3, 2007. Jump up ^ Raptors Schedules & Results 2005–2006, nba.com/raptors, accessed August 3, 2007. ^ Jump up to: a b c d Chris Bosh Info Page – Career Stats and Totals Archived 2014-08-10 at the Wayback Machine., nba.com, accessed November 12, 2007. ^ Jump up to: a b "Raptors Re-Sign Bosh to Multi-Year Contract Extension", nba.com/raptors, July 14, 2006, accessed August 3, 2007. ^ Jump up to: a b "Raptors Re-Sign Chris Bosh To Contract Extension", nba.com/raptors, July 14, 2006, accessed August 3, 2007. Jump up ^ Raptors Post Up, nba.com/raptors, January 26, 2007, accessed April 26, 2007. ^ Jump up to: a b "Raptors voted all-star starter" cbc.ca, January 25, 2007, accessed April 27, 2007. Jump up ^ Raptors Post Up, nba.com/raptors, January 31, 2007, accessed April 26, 2007. Jump up ^ Game Notes, nba.com/raptors, January 31, 2007, accessed March 20, 2007. Jump up ^ "Bosh named Eastern Conference Player of the Month", nba.com/raptors, February 2, 2007, accessed March 20, 2007. Jump up ^ Smith, Doug, Bosh's career-high 41 sparks 'M-V-P' chant, thestar.com, February 7, 2007, accessed April 27, 2007. Jump up ^ Post-Game Notes, nba.com/raptors, accessed March 20, 2007. ^ Jump up to: a b Smith, Doug, "Raptors' small-ball ices Heat", thestar.com, March 29, 2007, accessed April 27, 2007. Jump up ^ Raptors Forward Chris Bosh Named Eastern Conference Player Of The Week, nba.com/raptors, April 2, 2007, accessed April 26, 2007. Jump up ^ Raptors Post Up, nba.com/raptors, April 15, 2007, accessed April 27, 2007. ^ Jump up to: a b Raptors Post Up, nba.com/raptors, April 21, 2007, accessed July 13, 2009. Jump up ^ Grange, Michael, "Back to square one as Raptors even the series", The Globe and Mail, April 24, 2007. Jump up ^ Raptors Post Up, nba.com/raptors, May 1, 2007, accessed July 13, 2009. Jump up ^ Raptors Post Up, nba.com/raptors, May 4, 2007, accessed July 13, 2009. Jump up ^ Phoenix Duo Highlights All-NBA First Team, nba.com, May 10, 2007, accessed May 12, 2007. Jump up ^ Grange, Michael, "Colangelo, Mitchell have issues to reconcile", Globe and Mail, April 29, 2008. Jump up ^ Two Hometown Hornets Named as Reserves for 2008 NBA All-Star Game, nba.com, January 31, 2008, accessed February 1, 2008. ^ Jump up to: a b Smith, Doug, "Season over for deflated Raptors", thestar.com, April 29, 2008, accessed April 30, 2008. Jump up ^ Feschuk, Dave, "Ford finally firing on all cylinders for Raptors", thestar.com, April 25, 2008, accessed July 13, 2009. Jump up ^ Magic at Raptors Game Info, nba.com, April 26, 2008, accessed July 13, 2009. Jump up ^ Smith, Doug, "Colangelo: Sam's safe 'for now'", thestar.com, April 30, 2008, accessed July 13, 2009. Jump up ^ MVP Kobe Bryant Highlights All-NBA First Team, nba.com, May 8, 2008, accessed November 22, 2008. Jump up ^ Sources: Pacers agree to O'Neal-for-Ford swap with Raptors, sports.espn.go.com, accessed August 4, 2008. Jump up ^ Bosh Named Eastern Conference Player Of The Week, raptors.com, accessed November 4, 2008. ^ Jump up to: a b c d Post-Game Notes, nba.com/raptors, November 5, 2008, accessed November 7, 2008. Jump up ^ Feschuk, Dave, "Giveaways gut Bosh's big night", thestar.com, November 19, 2008, accessed November 20, 2008. Jump up ^ Mitchell Relieved Of Duties, Jay Triano Takes Over On Interim Basis, nba.com/raptors, December 3, 2008, accessed December 3, 2008. ^ Jump up to: a b Aldridge, David, "Raptors trade O'Neal, Moon to Heat for Marion, Banks" Archived February 15, 2009, at the Wayback Machine., nba.com, 13 February 2009, accessed 14 February 2009. Jump up ^ Shaq, pair of Magic players highlight All-Star reserves Archived 2009-03-15 at the Wayback Machine., nba.com, January 29, 2009, accessed January 30, 2009. Jump up ^ Chandler scores 17, Knicks beat Raptors 112–103, nba.com, April 5, 2009, accessed April 11, 2009. Jump up ^ Smith, Doug, "Bosh helps Raptors end season on a high note", thestar.com, April 16, 2009, accessed April 17, 2009. Jump up ^ Raptors GM plans to offer Bosh extension Archived 2016-01-06 at the Wayback Machine., nba.com, April 20, 2009, accessed April 21, 2009. ^ Jump up to: a b Grange Michael, "Bigger and better", Globe and Mail, June 14, 2009. Jump up ^ Grange, Michael, "Jack could provide fringe benefits for struggling Raptors ", The Globe and Mail, July 12, 2009. ^ Jump up to: a b Toronto Raptors 2009–10 Schedule, nba.com/raptors, accessed July 11, 2010. Jump up ^ Chris Bosh Game Log, sports.espn.go.com, accessed November 11, 2009. Jump up ^ Bosh becomes Raptors all-time leading scorer, sports.espn.go.com, January 3, 2010, accessed January 4, 2010. Jump up ^ DOUBLE-DOUBLE LEADERS: Total Double Doubles Archived 2012-11-10 at the Wayback Machine., nba.com, accessed January 15, 2010. Jump up ^ Bogut posts double-double as Bucks overcome big night from Bosh, espn.go.com, January 20, 2010, accessed January 22, 2010. Jump up ^ Nowitzki leads parade of reserves to Dallas Archived 2016-03-04 at the Wayback Machine., nba.com, January 28, 2010, accessed January 29, 2010. Jump up ^ Chris Bosh, Kevin Durant named Player of the Week Archived 2016-01-06 at the Wayback Machine., nba.com, February 1, 2010, accessed February 2, 2010. Jump up ^ Bosh Named Eastern Conference Player Of The Week, nba.com/raptors, April 5, 2010, accessed April 7, 2010. Jump up ^ MacKenzie, Holly, "Bulls top Raptors in showdown for last Eastern playoff spot", nba.com, April 11, 2010, accessed July 11, 2010. Jump up ^ HEAT Re-Sign Wade and Acquire James and Bosh, NBA.com, July 10, 2010, accessed July 10, 2010. Jump up ^ Smith, Doug (8 July 2010). "Without Chris Bosh, Raptors have much work to do". The Star. Toronto. Retrieved 27 February 2013. Jump up ^ Gilbert, Erika. "Bosh says goodbye to Toronto, hello to Miami on website Archived 2013-09-25 at Archive.is", National Post, July 8, 2010, accessed September 24, 2013. Jump up ^ Chris Bosh the power broker in Heat’s three-for-all, thestar.com, July 10, 2010, accessed July 11, 2010. Jump up ^ "Heat thank November swoon for helping them find way to bloom". Nba.com. 2011-01-13. Archived from the original on 2016-02-22. Retrieved 2016-06-27. Jump up ^ "Chris Bosh leads short-handed Heat past Hawks in triple OT". ESPN. January 5, 2012. Retrieved September 9, 2013. Jump up ^ "Chris Bosh to start All-Star Game". Espn.go.com. 2013-02-15. Retrieved 2016-06-27. Jump up ^ Buckley, Zach (June 19, 2013). "Chris Bosh Answers Critics With Gritty Game 6 Finals Performance for Miami Heat". bleacherreport.com. Retrieved June 22, 2013. Jump up ^ "HEAT Re-Signs Chris Bosh". NBA.com. Turner Sports Interactive, Inc. July 30, 2014. Retrieved July 30, 2014. Jump up ^ "Josh McRoberts has torn meniscus". Espn.go.com. 2014-12-15. Retrieved 2016-06-27. Jump up ^ "Magic hold off Heat at end, 102-101". Nba.com. Retrieved 2016-06-27. Jump up ^ Freeman, Eric (2015-02-20). "Chris Bosh admitted to Miami hospital for lung tests, Heat say health issue isn't life-threatening". Sports.yahoo.com. Retrieved 2016-06-27. Jump up ^ "Chris Bosh could be out for season". Espn.go.com. 2015-02-21. Retrieved 2016-06-27. Jump up ^ "Heat's Chris Bosh out for season". Espn.go.com. 2015-02-22. Retrieved 2016-06-27. Jump up ^ "Bosh returns, Heat top Hornets 104-94 in season opener". Nba.com. Retrieved 2016-06-27. Jump up ^ "Bosh scores season-high 30, Heat top Lakers 101-88". Nba.com. Retrieved 2016-06-27. Jump up ^ "Ellington's 7 3-pointers help Nets rally past Heat, 111-105". Nba.com. Retrieved 2016-06-27. Jump up ^ "Heat rally from 18 down, top Pacers 103-100 in OT". Nba.com. Retrieved 2016-06-27. Jump up ^ "Chris Bosh won't play in All-Star Game; Al Horford to join East team". Espn.go.com. 2016-02-13. Retrieved 2016-06-27. Jump up ^ Wojnarowski, Adrian (2016-02-24). "Sources: With mounting pressure to sit out season, Bosh meeting with Heat officials". Sports.yahoo.com. Retrieved 2016-06-27. Jump up ^ "Miami HEAT Statement On Chris Bosh". NBA.com. Turner Sports Interactive, Inc. September 23, 2016. Retrieved September 27, 2016. Jump up ^ Reynolds, Tim (September 23, 2016). "Bosh fails physical, not cleared for training camp". NBA.com. Turner Sports Interactive, Inc. Archived from the original on September 26, 2016. Retrieved September 27, 2016. Jump up ^ Smith, Sekou (September 26, 2016). "Heat president Riley says Bosh's career in Miami is 'probably over'". NBA.com. Turner Sports Interactive, Inc. Retrieved September 27, 2016. Jump up ^ Smith, Sekou. "Chris Bosh, Miami Heat agree to part ways". ESPN.com. Retrieved May 24, 2017. Jump up ^ "Reports: Doctor's ruling on Chris Bosh's health will help Heat's cap situation". ESPN.com. June 2, 2017. Retrieved June 2, 2017. Jump up ^ "HEAT Waive Chris Bosh". NBA.com. July 4, 2017. Retrieved July 4, 2017. Jump up ^ Clements, Rob (July 4, 2017). "Heat officially waive Chris Bosh, will retire his No. 1 jersey". SportingNews.com. Retrieved July 5, 2017. ^ Jump up to: a b c d "USA Basketball: Bio: Chris Bosh". usabasketball.com. Archived from the original on February 24, 2007. Retrieved February 9, 2016. Jump up ^ 2006 FIBA World Championship, fiba.com, accessed March 20, 2007. Jump up ^ Chris Bosh leaves U.S. training camp because of left foot injury Archived October 10, 2007, at the Wayback Machine., sports.yahoo.com, August 15, 2007, accessed November 5, 2007. Jump up ^ Bosh named to U.S. Olympic team Archived October 4, 2011, at the Wayback Machine., olympics.thestar.com, June 23, 2008, accessed June 24, 2008. Jump up ^ US hoops back on top, beats Spain for gold medal Archived 2014-04-19 at the Wayback Machine., sports.yahoo.com, August 24, 2008, accessed August 24, 2008. Jump up ^ USA Archived 2013-05-14 at the Wayback Machine., usabasketball.com, accessed August 25, 2008. Jump up ^ "Chris Bosh out of Olympics to rest, rehab injury". USA Today. June 29, 2012. Jump up ^ O'Connor, Joe, "Bosh still learning to be a leader" Archived January 6, 2016, at the Wayback Machine., canada.com, January 18, 2008, accessed April 12, 2008. Jump up ^ Big, bad Raptors trample Wolves, thestar.com, October 9, 2009, accessed October 14, 2009. ^ Jump up to: a b Thomsen, Ian, "Leading man", sportsillustrated.cnn.com, February 6, 2007, accessed March 20, 2007. Jump up ^ MacKenzie, Holly, "Led by Bosh, Raptors drop Pacers for fifth straight win", nba.com, January 31, 2010, accessed February 1, 2010. Jump up ^ Grange, Michael, "Bosh plays leading role in playoff push", globeandmail.com, April 6, 2007, accessed April 7, 2007. Jump up ^ Raptors Post-Up, nba.com/raptors, November 8, 2006, accessed March 20, 2007. Jump up ^ Feschuk, Dave, "Chris Bosh: Father figure", thestar.com, April 6, 2007, accessed April 6, 2007. ^ Jump up to: a b Post-Game Notes, nba.com/raptors, January 16, 2008, accessed January 18, 2008. Jump up ^ Bosh Named One Of The Divisional Winners For 2007–08 NBA Sportsmanship Award, nba.com/raptors, April 3, 2008, accessed April 4, 2008. Jump up ^ CBTV, youtube.com, accessed January 15, 2010. Jump up ^ Chris Bosh/First Ink a documentary Archived 2010-02-27 at the Wayback Machine., hmv.ca, accessed December 15, 2009. Jump up ^ "NBA All-Star Chris Bosh Gears Up As Heimdall in "Hulk and the Agents of SMASH"". Comic Book Resources. Retrieved 2016-06-27. Jump up ^ Buckley, Zach (February 10, 2014). "NBA All-Star Chris Bosh Lends His Voice to Marvel's Hulk & the Agents of S.M.A.S.H". Retrieved February 10, 2014. Jump up ^ "Chris Bosh played a ringer on 'Parks and Rec'". ^ Jump up to: a b Official website, Chris Bosh Foundation, accessed March 20, 2007. Jump up ^ "Chris Bosh Receives NBA Community Assist Award", nba.com/raptors, July 19, 2005, accessed March 20, 2007. Jump up ^ Bosh Named National Spokesperson For Boys And Girls Clubs Of Canada, nba.com/raptors, November 23, 2008, accessed November 24, 2008. Jump up ^ "Leaders and trend-setters all agree on one thing". code.org. Retrieved 26 February 2013. Jump up ^ "Chris Bosh banking on team workouts". ESPN. September 3, 2011. Retrieved March 18, 2016. Jump up ^ "Chris Bosh's New Baby Daughter, Dylan Skye, Is The Cutest". HuffingtonPost.com. November 5, 2013. Retrieved March 18, 2016. Jump up ^ "Chris and Adrienne Bosh Welcome Twin Sons Phoenix Avery and Lennox Noel". People.com. March 16, 2016. Retrieved March 18, 2016. Jump up ^ Saponara, Michael (March 8, 2017). "Rico Love & Chris Bosh Co-Produced An Upcoming Track For Gucci Mane". vibe.com. Retrieved November 10, 2017. Jump up ^ Feschuk, Dave, "Raptor Bosh a deadbeat dad, lawsuit says", thestar.com, March 24, 2009, accessed March 25, 2009. ^ Jump up to: a b Feschuk, Dave, "Bosh says he's already supporting young child", thestar.com, March 27, 2009, accessed March 29, 2009. Wikimedia Commons has media related to Chris Bosh.